I love a good collaboration. 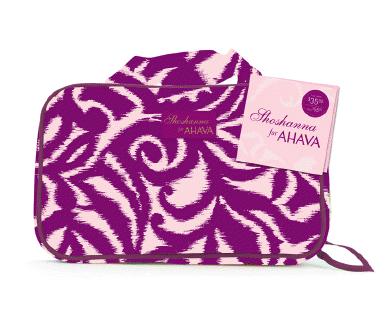 And the limited-edition Shoshanna for AHAVA Holiday Set is definitely one of my favorites in a long time. For starters, AHAVA is one of my very favorite beauty brands. I've been using the products for years, and when I visited Israel two years ago, I made sure to stock up at the AHAVA boutique at the Dead Sea! (Everyone on my trip bought hundreds of dollars worth of AHAVA products on that trip. True story.) So I suppose it comes as no surprise that this set would call my name. This set contains travel sizes of Mineral Hand Cream, Mineral Body Lotion and Dermud Intensive Foot Cream, which are three of my go-to products from the line. Each moisturize, nourish, soften and smooth the skin in an instant. As if that's enough, they come in a gorgeous case by Shoshanna! Shoshanna was inspired by AHAVA's ability to make women look and feel their best at any age. I'm totally in love with the bold, colorful swirl print and the grosgrain pull tabs on the zipper ... and the fact that the interior contains two oversized zip pouches that fit so many beauty products!